I love that rocket is everywhere here in the UK. We call it Arugula in the US and it has always been one of my favorites. The other day we got together with some new friends for a late-evening dinner, and this was the appetizer they served. HUGE HEART EYES. This combo is brill. Prosciutto + pine nuts + rocket all rolled up into one tasty, fresh, powerapp. Almost like a salad you can eat with your fingers! Bring this to your next potluck, or serve it as a starter with drinks next time you host a dinner gathering. This is so good. Place the beans in a bowl, cover with boiling water and leave for 1 minute. Drain and refresh under cold water. Combine the beans with the leaves, pine nuts and parmesan. Drizzle with the olive oil and lemon juice, then season to taste. Lay out the prosciutto slices, put a handful of bean mixture on each, then roll them up. Drizzle with the balsamic dressing just before serving. Makes 6. Make this with confidence. You are now a gourmet chef. This is so fun to eat, they don’t fall apart, and the flavors are incredibly sophisticated. Thanks to my dear friend Becs who generously shared this with me! The morning started off a little rough…middle daughter woke up feeling a bit sick and oldest daughter was already whining about what I was going to “make” her eat for breakfast. 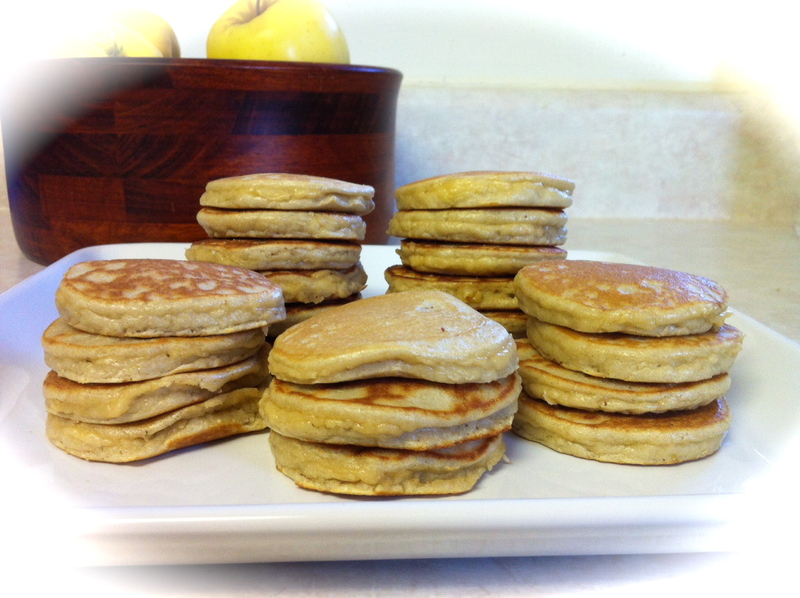 So, I set out to whip up these pancakes from Elana’s Pantry they usually all enjoy, but needed to make some adaptations. I gave up honey for Lent and I was too hungry not to partake! Fast forward a half an hour later and they turned out fluffy and yummy! They were devoured by all, even my husband (who generally doesn’t like anything almond flour based) snuck a few. The one banana added just enough sweetness without turning them completely banana flavored. Pancakes aside, I’d also use them as a medium for over-easy eggs “dippy” eggs or nut butter sandwiches. Heat large skillet to medium heat. Combine all wet ingredients, add dry ingredients and mix until a nice batter forms. Melt butter or coconut oil on skillet. Spoon desired amount onto skillet–smaller seems to work better and kids just generally love things that are more their size. Flip once bubbles begin to form and bottoms look set, and cook on other side. Continue until batter is gone, adding oil or butter as necessary. Serve plain with a side of fresh fruit, toasted, topped with fried eggs, or drizzled with yogurt!